The Maryland Planning Commissioners Association warmly thanks everyone who attended and contributed to its 35th annual conference in Gaithersburg on October 25 and 26, with a special appreciation for the hard work of the City of Gaithersburg, Mayor Jud Ashman, and the City’s exceptional staff! The MPCA has never felt so welcomed. The tour of new urbanist neighborhoods was fantastic, and Planning Director John Schlicting inspired attendees with his welcome during Thursday night’s reception. One of Gaithersburg’s own, Planning Commissioner Danny Winborne, was elected MPCA President. Well deserved it was, as Danny tirelessly contributes to his community, his alma mater (Morgan State), and to the MPCA. Congratulations Danny and to the other MPCA Officers: Bill Butts (Mt. Airy) Vice President; Roxanne Hemphill (Mt. Airy) Secretary; and Doug Wright (Hagerstown) Treasurer. Particularly successfully was the signature session, with the same name as the conference theme. The MPCA would like to thank the Maryland Chapter of the American Planning Association for its support developing the content and recruiting speakers for the session. Finally, the MPCA would like to thank Robert Reed and Bob Elliott, previous President and Treasurer of the organization, for their years of dedication to the organization. Visit the MPCA webpage for 2018 conference presentations. 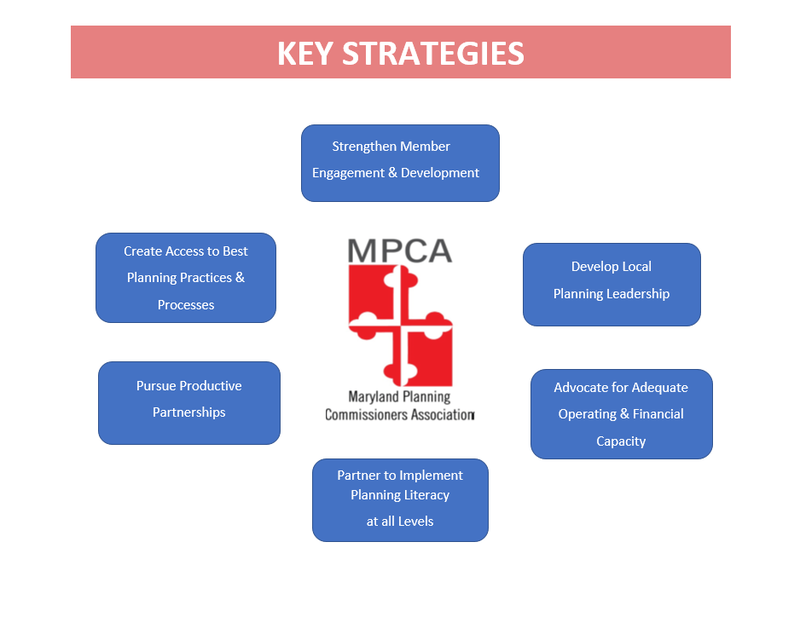 The MPCA looks forward to implementing its new strategic plan in 2019 (see graphic), and is currently planning a regional workshop for late winter/early spring of 2019.